The Good Stuff: Well, I read this all the way through and at the start I was thinking 'this is all pretty obvious' and it is, but this spells it out and makes you aware of the process and methods. It really opened my eyes to how little consideration I have put into planning my character arcs in the past. I will certainly be more aware of this in future and I think I will be inclined to give it greater consideration in future. Hopefully I will see further improvement in my writing from this. 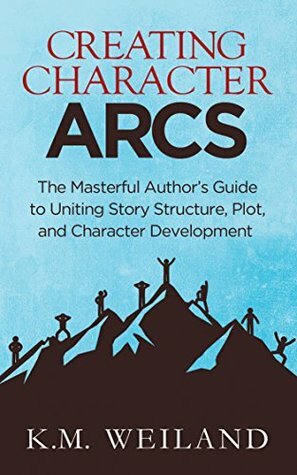 Overall it was a good read, easy to understand and informative and I would recommend it to anyone who wants a better understanding of character arcs. I'm giving it 4 out of 5 Golden Bookmarks! Sign into Goodreads to see if any of your friends have read Creating Character Arcs. 7.09% "Good book so far, I need to drum this stuff into my brain!" 50.0% "My thoughts so far. This could definitely be a useful book, I'm not sure how much I'm gonna retain though. There are lots of examples to support the information, but for me this is distracting and feels like filler. Most of the stuff here comes naturally, but it is good to have it spelt out to gain a better understanding."